Nearly forty-three million Americans are now grappling with debt from student loans, a burden that has grown 144 percent in just ten years. And the trend isn’t slowing down: in the past year alone, student loan debt increased by $75.4 billion nationwide, and individuals with student loan debt now owe on average slightly more than $33,000. There are more than 300 public and private colleges and universities across New York State (a number surpassed only by California) serving 1.2 million students. With a large number of institutions enrolling so many individuals, it is easy to understand why monitoring and addressing student debt issues in New York has become a high priority of state policymakers. The burden of debt is very real for student loan borrowers. Better understanding the actual size, scope, and impact of student debt in New York is critically important if issues are to be properly addressed and solutions appropriately tailored to provide the most effective relief. Forty-two percent of students at public and private colleges and universities in New York State graduate without student loan debt. 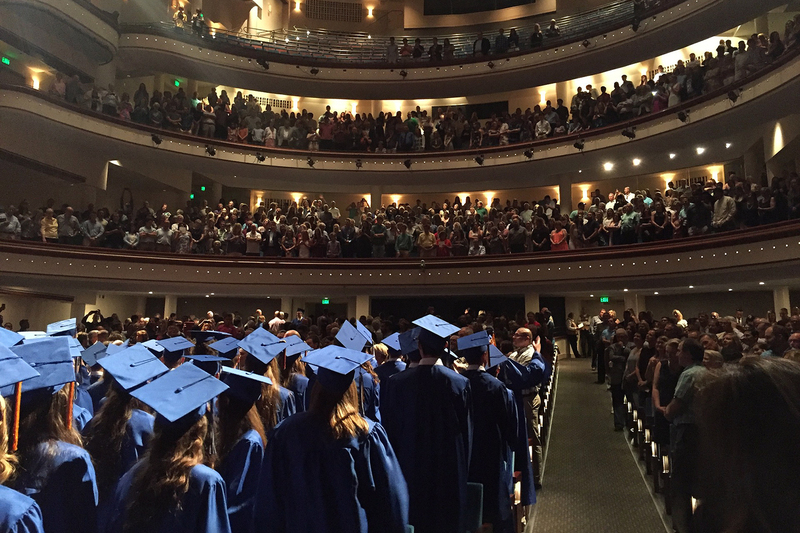 While a majority of students (58 percent) graduate with debt, this relatively modest proportion ranks the state in the middle of the pack nationally at twenty-seventh. 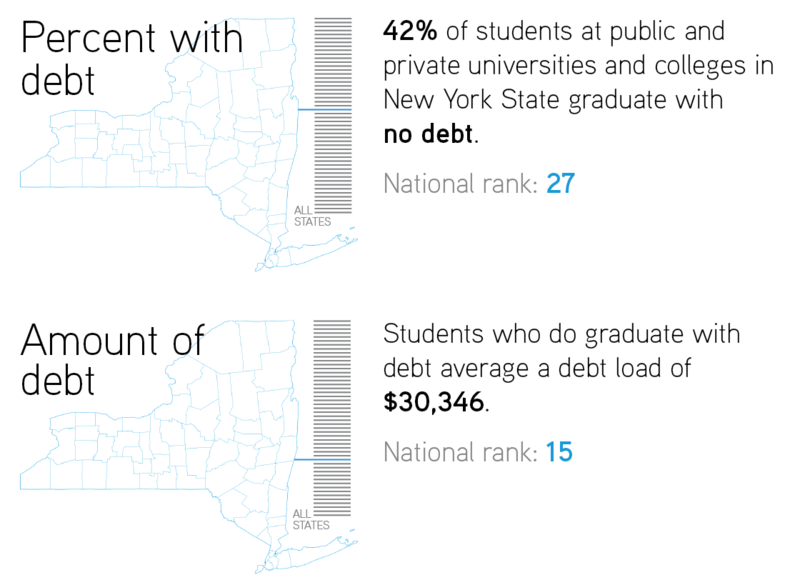 Students who do graduate with debt, however, borrow far more than average: for graduates from colleges and universities in New York, the average student debt load of $30,346 ranks the state fifteenth highest in the country. The State University of New York (SUNY) serves nearly 400,000 undergraduate students each year, and spanning sixty-four campuses is the largest comprehensive system of public universities, colleges, and community colleges in the nation. A particular focus on student debt at the state’s public institutions is appropriate. Last year alone, more than $637 million in subsidized, unsubsidized, and other federal student loans were disbursed to SUNY undergraduates. In 2017, similar to each of the past several years, slightly more than half (53 percent) of all SUNY undergraduate students, both two-year and four-year degree recipients combined, graduated with college debt. Put another way, nearly half of all graduating SUNY students have no student debt. SUNY baccalaureate degree students graduating with debt have an average student loan burden of approximately $26,600, and associate degree students graduating with debt have an average student debt load of about half that, or slightly more than $13,300. A smaller proportion of students graduating from the City University of New York (CUNY) system of eleven senior colleges; seven community colleges; and six graduate, honors, and professional schools do so with student loan debt and, for those who do, the average debt load is far smaller even than for graduates from SUNY schools. About 21 percent of all undergraduates from CUNY’s two-year and four-year schools graduated with debt in 2017, a percentage that has remained stable since 2010; combining both bachelor and associate degree recipients, the average debt for a CUNY undergraduate is about $11,700. New York has a more modest standing regarding student debt burden because the state has been a national leader in keeping the overall cost of college low and providing substantial financial assistance to students. These policies have increased access to college for tens of thousands of students while helping them avoid unmanageable levels of student debt as they graduate and enter the workforce. SUNY’s base annual tuition is approximately $1,000 lower than tuition at any surrounding state university system, and nontuition costs are lower than any other state in the region. New York also ranks in the top-ten states nationally for having the lowest tuition at its four-year public universities, with average annual tuition and mandatory fees more than 20 percent lower than the national average and eleventh lowest in the entire country. With the adoption in 2011 of the SUNY and CUNY Rational Tuition program — a plan that replaces unpredictable and burdensome spikes in tuition with modest and known annual increases — tuition increases have been capped at a maximum of $200 per year since the fall of 2017. It doesn’t stop there. New York offers some of the most robust cost-cutting — and thus debt avoidance — programs in the nation, ranking second-highest in the nation of all states in terms of total grant aid awarded to its college students and ranking first nationally for aid awarded based on students’ financial need. Excelsior Scholarship. Started in 2017-18, the Excelsior Scholarship program offers free tuition to any full-time resident undergraduate student from an income-qualifying family who attends a college in the SUNY or CUNY system. For 2018-19, students from families with an annual income less than $125,000 are eligible. In February 2018, SUNY and CUNY reported increased applications to their systems of 9 percent and 11 percent, respectively, a likely indication that the Excelsior Scholarship program is significantly increasing access to college for many students. For the average four-year SUNY student, the Excelsior Scholarship reduces the overall cost of college by approximately $26,600, equivalent to the average amount of student loan debt for those graduating with debt. Not only is the Excelsior Scholarship providing more students the opportunity for higher education, it has also allowed those students a path to complete their degrees on time and to do so debt-free. Tuition Assistance Program (TAP). New York State awards approximately $1 billion in grant aid to working-class students through the TAP program, constituting 95 percent of the state’s total college grant aid. About 336,000 students who meet the program’s basic eligibility criteria currently receive some level of TAP award, and the average award is $3,320 per student. Opportunity Programs. The burden of student debt on at-risk and lower-income students can be particularly onerous, and for many just the prospect of incurring student debt could cause them to decide to avoid college altogether. New York State is actively addressing these concerns, providing an array of programs that supply additional supports to at-risk students to help dramatically lower the cost of college and help them remain in college through completion. Free-tuition programs such as the Excelsior Scholarships are optimized when these “opportunity programs” are made part of the equation. In 2018-19, the state’s Higher Education Opportunity Program (HEOP) will award more than $32 million to students across the SUNY system, an amount that has risen by 65 percent since 2012. CUNY’s College Discovery program and the Search for Education, Elevation, and Knowledge (SEEK) program provide students with various academic, financial, and social supports. More than $28 million in SEEK grants were awarded in 2016-17, an increase of 62 percent from six years prior. CUNY also offers tuition waivers and advisory support services at nine of its schools through an initiative called the Accelerated Study in Associate Programs (ASAP). Students participating in ASAP have seen their time to graduation decrease greatly, spending less time in school and thus having less need to accrue student debt to pay for extended stays. New York offers other grant, scholarship, and award programs that help college students avoid the need to incur debt. These include several designed for part-time students (Part-time TAP, Aid for Part-time Study, Part-time Scholarship Award); general grant and scholarship programs (NYS Scholarships for Academic Excellence, Enhanced Tuition Awards, Veterans Tuition Awards); and grants for specialized study (NYS Child Welfare Worker Incentive Scholarship Program, NYS STEM Incentive Program). For those students who do graduate with debt, New York provides an array of debt forgiveness and relief programs. One particularly significant program is the Get on Your Feet Loan Forgiveness Program, the only statewide program to pay the full student loan for eligible students, and one of the few state-level student debt-relief programs in the nation. Under this program, the state will pay twenty-four monthly installments of a federal loan for a graduate if the individual is employed in New York State, has a gross adjusted income of under $50,000, and is participating in one of the available federal income-based student loan repayment plans. This program offers substantial direct debt relief to qualifying lower-income students, most of them newly entering the job market after graduation when such assistance can be particularly impactful. Other student loan forgiveness programs include the Regents Physician, District Attorney and Indigent Legal Services Attorney, Young Farmers, Licensed Social Worker, and Nursing Faculty loan forgiveness program. Combined, the state spent more than $5.3 million on student loan forgiveness in 2016-17. For many individuals graduating from New York colleges and universities with student loan debt, the financial burden is real and significant. New York’s approach to keeping tuition low at its public institutions combined with its array of generous scholarship, financial aid, and loan forgiveness programs is working to keep the number of these debt-burdened college graduates as small as possible. SUNY Office of Institutional Research & Data Analytics, June 2018. For four-year degree graduates alone, approximately 65 percent of students graduated from SUNY with loan debt. CUNY Office of Institutional Research, June 2018. At four-year CUNY institutions alone, about 26 percent of students graduate with debt. Average debt has risen approximately 16 percent since 2010. SUNY Office of Institutional Research & Data Analytics, June 2018. Data provided by the New York State Division of the Budget.